This is a guest article written by Miguel Olfato. Miguel is a strength and conditioning intern at Saltus, as well as a Kinesiology undergraduate student and athletic trainer at UBC. An avid basketball fanatic, Miguel is pursuing a career in strength and conditioning. The intent of this article is to facilitate the education of our interns by having them understand the theory and science behind strength & conditioning, while balancing it with practical application. Many sports that involve dynamic movement require the athlete to be fast, strong, explosive, and have endurance. This becomes more evident as the level competition increases. The deadlift is an excellent training tool for improving on all these attributes. The deadlift involves picking up dead weight from the ground and bringing it up to the hips. Not only does it work on the aforementioned qualities, it is also beneficial to overall health and injury prevention. One of the most important things for an athlete to develop is a good strength base, which is developed by the deadlift. The strength of the musculature needed for running fast and jumping high is developed because the deadlift works on strengthening the spinal erectors, hips, quadriceps, gluteal, and hamstring muscles. Deadlifting also emphasizes a hip hinge, a movement that is commonly used in sports. Examples of these are the athletic stance and jumping for a rebound in basketball. A proper strength base can also help movement economy, which can also help the athlete’s overall endurance. Research shows that developing proper hip hinge technique through deadlifting is a good progression tool for Olympic lifting, which helps further develop explosiveness and power needed to excel in athletic competition. Sports which are multi-directional in nature will have instances where there is a possibility to get knocked off- balance. 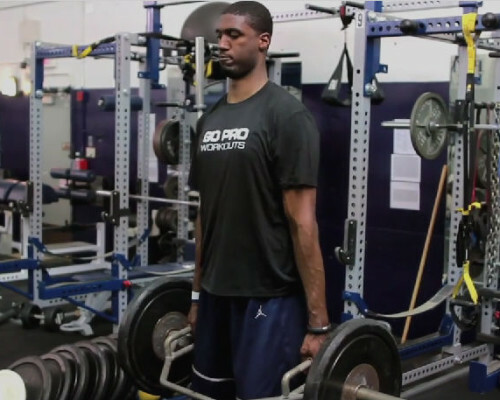 Having a good strength base will help an athlete keep their body in control. For example, in basketball it will be easier to finish a 3-point play, and it will be easier for a receiver to make that off-balance mid-air catch in football. It becomes easier for an athlete to make such types of plays when they can control their bodies in unconventional angles. Proper deadlifting techniques have major health benefits for every person. Postural deficiencies brought about by sitting and slouching for extended periods of time can be significantly improved through proper deadlifting techniques. The exercise requires you to keep your chest up, and back flat, which is brought about by strengthening the erector spinae muscles. Deadlifting helps neutralize the occurrence of muscular imbalances, which is a major source of injury. For example, the deadlift will improve the strength of the hamstrings and gluteal muscles for someone who is quadriceps and hip (anterior chain) dominant. It will also improve the strength of hips and quadriceps for someone who is hamstrings and gluteal (posterior chain) dominant. Deadlifting also helps in decreasing the likelihood of both chronic and acute injuries to occur. The strength base is also essential in decreasing the likelihood of injury. Deadlifts improve on the strength of the muscles to be able to absorb the impact brought about by running, jumping, and body contact. Movement mechanics are also improved by deadlifting, which is very important in injury prevention. A prime example of how incorporating the deadlift for injury prevention can be seen with Stephen Curry of the Golden State Warriors. He is known to be able to deadlift 400 pounds, at a body weight of 185 pounds, second strongest on his team. He used the deadlift as a tool in recovering from chronic ankle injury that has plagued him in the past. The deadlift significantly improved the strength of his hips. The increased strength of his hips helped reduce the stress on his ankle joints. Deadlifting can also decrease the likelihood of acute injuries to occur. The bulk of acute injuries occur when the athlete is off-balance. Having a good strength base will decrease the likelihood of an athlete getting knocked completely off-balance. Stephen Curry was also able to reduce the risk of acute injuries from his increased hip strength because he would be able to control his body in many different angles. Deadlifts have many variations, but the focus of this article would be on the conventional deadlift, the Romanian deadlift, and the Sumo deadlift. The conventional deadlift would be characterized by a stance at approximately hip width. It is a total body exercise, which focuses on strengthening the hips, gluteal muscles, hamstrings, quadriceps, and spinal erectors. The Romanian deadlift has the same stance width as the conventional deadlift, but travels through a shorter range of motion. The athlete does not have to pick up the weight up from the ground on each rep, but instead will extend the hips when the barbell reaches at around slightly below the kneecaps. The focus of the Romanian deadlift is more on the spinal erectors and hamstrings, as well as prepares the athlete for Olympic lifts, which further build explosiveness and speed. One may also utilize single leg Romanian dead lifts with dumbbells or kettle bells to work on unilateral strength and stability. The Sumo deadlift is characterized by a wider stance than the former two. This puts less stress on the back because it requires the athlete to work through a shorter range of motion, and would benefit an athlete who tends to round their back. The Sumo deadlift works on the same musculature as the conventional deadlift, but focuses more on its lower body components more than the spinal erectors. When performing a deadlift, the following must be taken into account of when through the movement for both safety and efficiency. First is the proper hip hinge technique. A good way to visualize the hip hinge is to chop through the hips and to push your buttocks back toward the wall. This would be followed by full hip extension, which can be achieved by standing up all the way straight when lifting the weight. Another key point is to make sure the knees don’t go into valgus, which presents potential injury risks. This means the knees should not buckle inward throughout the movement. The athlete should aim to keep the back flat especially at the lumbar or lower back region. Finally, the athlete must aim to keep the weight as close to the body as possible. Overall, the deadlift is a very effective tool when training for sport performance. It helps develop strength, speed, power and muscular endurance, all of which are important in excelling in athletics. Deadlifts also benefit overall health because it improves movement patterns, addresses imbalances in the musculature, and corrects posture. It is definitely something I would recommend to athletes to do in order to get better at their sport.